Developed by OnNet for Windows. 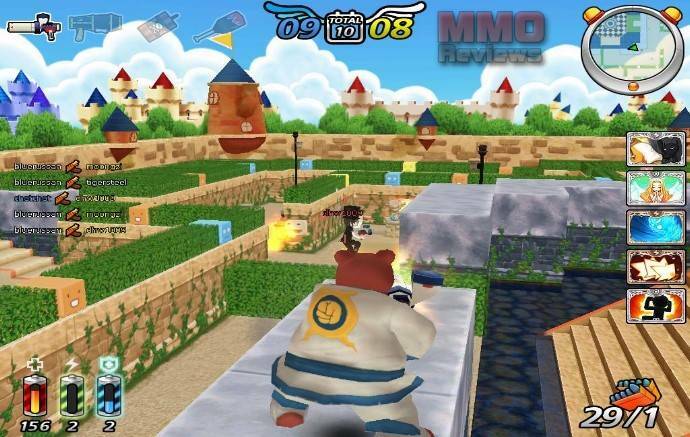 MangaFighter is a casual TPS (third person shooter) game based in a fantasy toy world. The easy of controls and non-violent contents are main advantages in MangaFighter. Moreover, MangaFighter has many unique kinds of weapons, special actions, and collective skill cards. You can experience fun that you’ have never had before. Pangaea is where all toy souls are born and exist. All toy soul’s dream is to become a beloved toy by all children. One full moon night the only time when the Earth and Pangaea can be connected, two kids were accidentally brought to Pangaea. They are Ken and Hanna. Ken and Hanna learnt that if they want to go back home, they need to collect enough amount of Essences. The adventure of Hanna and Ken begins as they fight against toys in order to collect more Essences. Ken - Ken is a young boy with 100 health, 4 strength, and 5 speed. Hanna - Hana is a young girl with 100 health, 3 strength, and 5 speed. Kuma - Kuma is a giant teddy bear with 200 health, 8 strength, and 3 speed. He is much easier to hit than other characters due to his size. MiuMiu - An agile cat with 90 health, 2 strength, and 7 speed. MiuMiu is the hardest character to hit. Sai - A man with a circular TV for a head, Sai has 130 health, 4 strength, and 4 speed. Dr. Uru - Like Sai, Dr. Uru has a TV for a head but his is more rectangle shaped. He has 150 health, 5 strength, and 4 speed. Campus Credit (CC) is the GamesCampus Currency that can be used to purchase enhanced items from Cash Shop. Even though you can play all GamesCampus.com games for FREE, we offer enhanced items for players who wish to improve their game play. Players will also have the choice of multiple modes of combat and character customization. The game style allows for fast and intense combat, but with a fresh Manga-style look. Looking for more Free MMO third-person shooter,Free MMOs games?